I’m always looking for new videos to show my kids, especially when it comes to the content areas where I feel like I don’t have enough resources. We have an old science textbook, and we get FOSS kits, but there’s so much more to show students for them to really understand science concepts. I’ll be honest and say that my content areas get planned last, I don’t have nearly enough time to teach them, and I always feel like they could be so much better if I knew of better ways to show students what they need to know. 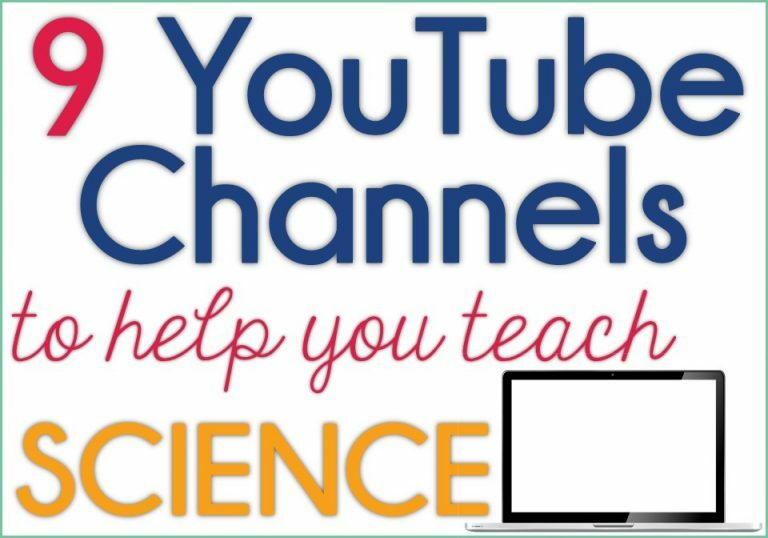 Science videos from these YouTube channels have been some of the best I’ve found during my strolls through the internet to help keep my science instruction engaging, relevant, and high quality! Click on each header below to head to that YouTube channel to see more science videos they have to offer. Crash Course Kids offers engaging video lessons on various science content. They’re playlists are super helpful because they’re organized by science strand. The host is a relatable girl who gives a good mix of vocabulary words while relating topics to things kids can understand. Here’s their video introduction on resources. David Newman gives videos with songs & lyrics to teach educational standards. They’re easy songs to learn, and he does each one is unique as compared to the others. I love using songs to teach concepts because the kids catch on and learn it before they even realize they do. Here is a song on simple machines that’ll be easy to teach to students. Idaho Public Television offers a series of videos in their D4K (Dialogue for Kids) Science Trek playlists. It features videos on science content like muscles, light, simple machines, and the Earth. The quality of the videos is a little older, so they won’t always be the most engaging for students, but the quality of the content is top-notch! Here’s a video on light and color to give you a glimpse into what they offer. Make Me Genius gives educational videos on a wide range of science topics that are great for the primary classroom. The videos are geared towards little learners and are often slow paced enough to really give students a chance to absorb the content while also quick enough to keep them engaged. The characters do have an accent, but that could also be a great teaching point in your classroom if students aren’t familiar with accents. This is a quick, helpful video on light reflection and refraction. Fun Science Demos offers videos for many of the Next Generation Science Standards. They have videos for physical science (matter, force and motion, energy, sound, and light); earth and space science (weather, rocks, solar system, water); and life science (habitats, life cycles, the human body). Here’s a video about sound and light traveling in waves. SciShow Kids explains many science topics for kids. While the videos aren’t exactly aligned to standards, their videos explore many topics the kids are interested in (paper snowflakes, oobleck). They do have a lot of science videos that can match your units too (rainbows or sound). Their partner channel, SciShow, also offers many different videos you might find useful for your classroom. Since they’re not geared towards kids, preview each one for relevance and appropriateness before showing. Here’s a video on making your own rainbow that would be a fun hands-on lesson for kids. ASAP Science has many visually engaging videos explaining a diverse range of science content. The channel itself is not suitable for children. However, many of the videos are and they’re such great quality that they’re worth including here. They also explore many fun topics that’ll get your kids interested in what they’re learning. (Farts, anyone?). It’s a fun channel to explore at home to look for videos that might fit with what you’re studying. Here’s a video on optical illusions to connect with your unit on vision, or the 5 senses, especially for intermediate students. One of my favorite tv series when I was growing up was Mr. Wizard. The fact that I can even remember the name of the channel 25 so many years after I stopped watching it, is a testament to its awesomeness. Either that, or I was a big nerd back when I was in elementary school. Either way, these science videos are still relevant and give great explanations that can be brought into our everyday lessons. Here’s a short video on how home thermostats work. Looking for more YouTube channels? Click the image below to see 6 YouTube Channels to Help you Teach Math!